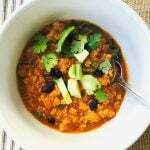 This 21 Day Fix Sweet Potato and Black Bean Chili is has the most amazing flavor and texture…even my sweet potato hating husband loves it! And it’s so easy to make in your Instant Pot or on the stove! In a large pot or dutch oven, heat 2 tsp of olive oil over medium heat. Add turkey to pan, along with 1 ½ tablespoons of the Salt Free Taco Seasoning and cook through; then add onions and kale and cook until soft. Season turkey and veggies with salt and pepper, then remove from pot. Add the remaining 2 tsp of olive oil to pan and saute sweet potatoes just until they start to brown. Add the garlic, 1 ½ tablespoons of the Salt Free Taco Seasoning, a sprinkle of salt, a can of fire roasted tomatoes, and 2 cups of chicken stock to the pot. Bring to a low boil and simmer for 10 minutes or so, until the sweet potatoes are very soft. You can leave the potatoes as is, but I **highly recommend** the following step to get an amazing texture to your chili. This is also the way to go if you have picky eaters in your house who “don’t like sweet potatoes” **Using an immersion blender, puree the mixture until it reaches your desired consistency (you can also transfer to a regular blender and puree that way, which is what I did! I just pulsed a few times). Add turkey mixture back to pot and stir in black beans. Add additional stock to reach desired thickness, as the chili will continue to thicken up as it cooks. Season with chili powder to taste, starting 1 teaspoon at a time so you don’t overdo it. And, if you want to bring out the flavor of the sweet potato a little more, you can add a spoon of maple syrup. If you want a little more spice, add the cayenne! Simmer for a few more minutes before devouring! Top with fresh chives, cilantro, shredded cheddar and avocado. YUM! Set IP to sauté and heat 2 tsp of olive oil. Add turkey to pot along with 1 ½ tablespoons of the Salt Free Taco Seasoning and cook through; then add onions and cook until soft. Season turkey with salt and pepper, then remove from pot. Add the remaining 2 tsp of olive oil to pan and saute sweet potatoes just until they start to brown. Add the garlic, 1 ½ tablespoons of the Salt Free Taco Seasoning, a sprinkle of salt, a can of fire roasted tomatoes, and 2 cups of chicken stock to the pot. Place cover on IP and lock. Set to 4 minutes of cooktime on manual. After cook time is through, do a quick release. You can leave the potatoes mixture as is, but I **highly recommend** the following step to get an amazing texture to your chili. This is also the way to go if you have picky eaters in your house who “don’t like sweet potatoes” **Using an immersion blender, puree the mixture until it reaches your desired consistency (you can also transfer to a regular blender and puree that way, which is what I did! I just pulsed a few times). Add turkey mixture back to pot and stir in black beans and kale. Add additional stock as necessary. Season with chili powder to taste, starting 1 teaspoon at a time so you don’t overdo it. And, if you want to bring out the flavor of the sweet potato a little more, you can add a spoon of maple syrup. If you want a little more spice, add the cayenne! Simmer for a few more minutes before devouring! Top with fresh chives, cilantro, shredded cheddar and avocado. YUM!